One morning earlier this year, at around 4:20 a.m., Latoya, CCHT, pulled into the parking lot at FMCNA Parkway Clinic in Huntsville, Ala., with dialysis patient Larry in his car right behind her. 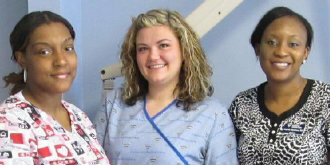 Parkway Huntsville, Ala., staff members who worked together to save a patient’s life are (l-r) Latoya, CCHT; Katie, CCHT; and Shyntia, RN. Latoya, who has been with FMCNA for two years, said she sensed something was not right. Larry, who Latoya said is in his 70s, parked near her and told her he wasn’t feeling well and was finding it difficult to catch his breath. He told her he needed oxygen. Latoya said she quickly went into the building to get oxygen, but when she returned to Larry’s car she found him on his back across the front seat with his legs out the drivers’ side door. By this time Katie, CCHT, was assisting Latoya and she called an ambulance. The two women were able to get Larry out of the car and lying on his back in the parking lot as they administered CPR. Meanwhile, other patients were arriving for their treatments that were to start at 5 a.m.
“We were still doing CPR when a short time later Shyntia, RN, arrived on the scene and took over the compression of Bartlett’s chest,” Latoya said. Once the EMS team arrived, they took over and treated Larry for another 15 to 20 minutes in the ambulance in the parking lot before going to Huntsville Hospital, Latoya said. Larry stayed in the hospital for a while, Latoya said. In about a month and a half he returned to the clinic for dialysis treatment, now he comes four times a week.